The International Financial Institutions (IFIs) and other entities grouped around economic growth and the Objectives of Sustainable Development (ODS) believe that infrastructure investment is vital for developing countries and overcoming poverty, especially in relation to providing basic services such as roadways, access to water, sanitation, and electricity. IFIs have carried out studies to demonstrate the correlation between infrastructure investment and economic growth, concluding that the low investment levels in Latin America and the Caribbean (LAC) have created a considerable infrastructure gap; therefore, it is necessary to inject considerable amounts of capital in these strategic sectors in the region. Given this challenge the multilateral banks decided to stimulate private investment through: (a) strengthening regulatory and institutional capacities to develop a well prepared portfolio of projects and (b) enhancing infrastructure as an asset class to channel private savings towards this sector. 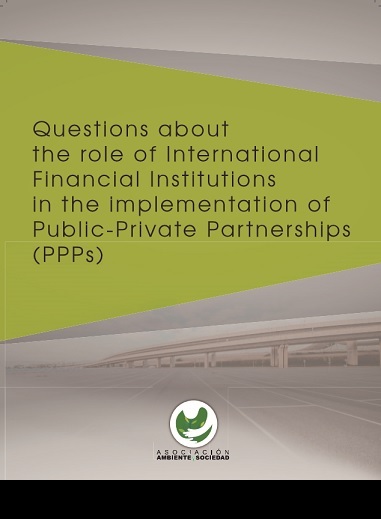 The objective of this document is to comment on the role of Financial Institutions as promoters of the PPP model in LAC. We will start with the policies and actions contemplated by IFIs in their agendas to promote PPPs. We will also comment on the ranking that IFIs have promoted to evaluate PPPs, according to which Chile, Mexico, Brazil, Colombia, and Peru are the countries with the best enabling environment to implement PPP projects. Finally, we will mention project cases in these countries, which reflect the major problems that have arisen: cost overruns, corruption, a lack of transparency and consultations, and social-environmental impacts.